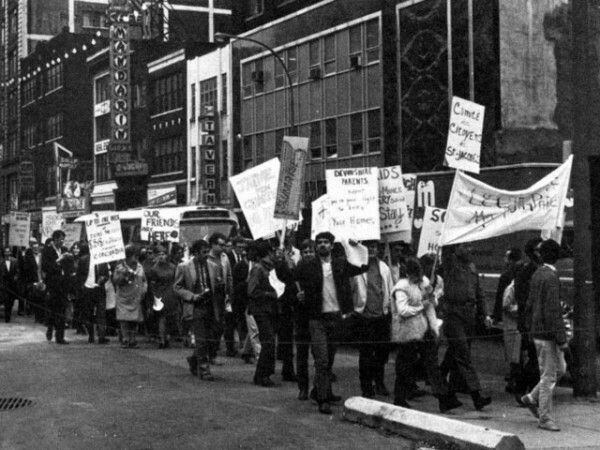 On May 24, 1969, a noisy group of demonstrators bearing protest signs and a petition marched from downtown Montreal to city hall. Many of the marchers were part of the newly-formed Milton-Park Citizens’ Committee. Their demands were nothing short of revolutionary: It was the first time in modern Montreal history that local residents had organized to oppose a private land-developer and assert their right to low-rent housing. Their opponent was Concordia Estates, a corporate land-developer with plans to demolish hundreds of affordable residences and erect luxury high rises in their place. What followed would be a 15-year battle waged over a 25-acre parcel of land in the Milton-Park neighborhood beside McGill University. Over the next few years, the MPCC would resort to increasingly radical tactics to protect their neighborhood: occupying the offices of Concordia Estates, blocking bulldozers and bumping heads with the police. Sparked by progressive new ideas of the late 60s, the movement eventually lead to the creation of one of the largest housing co-operatives in Canada. On April 26, 1979, Jacques Guilbault, the Liberal MP for the area announced that the 16 million-dollar housing project involving 613-units had been approved. By 1983, thanks to federal, provincial and municipal programs, which contributed $30.7 million, 597 units in the Milton-Park neighbourhood were renovated. By creating the co-ops, the Milton-Park Citizen’s Committee and Heritage Montreal succeeded in saving135 buildings from the wrecking ball. They also achieved their goal of maintaining affordable housing in the inner-city. Thirty-five years later, there are still a lot of lessons to be learned from the Milton-Park affair. It is also a time for renewed struggles, including protests to ensure that the Hôtel-Dieu Hospital on Pine Avenue continues to service the community. The latest protests are stark reminders of the MPCC’s rallying cry to oppose “Crimes against the Community” during neighbourhood street festivals in the early 1970’s. And yet, we hear little about the neighbourhood’s radical roots today. Few McGill students riding along the Milton bike path would know that occupations took place on the quiet residential streets. This is why we decided to create The Milton-Park Story website. With the help of residents and long-time activists, we’re building a multi-media oral history project dedicated to the past, present and future of this dynamic neighborhood. The website will include a feature length audio documentary a growing timeline, an interactive map and exclusive interviews with many members of the community. The Milton-Park community is truly unique and has been recognized internationally. The neighbourhood was selected as a finalist for the Habitat for Humanity Awards in 2013. In addition, community activist, and Milton-Park resident Lucia Kowalchuk was named to the Order of Canada this year. By creating a living, breathing online tribute to this neighborhood, we’re hoping to keep it’s history alive through the coming years, and perhaps even inspire a few more protests, street festivals championing citizens’ rights for low-rent housing.